One of house music, he has become somewhat of an elder statesman of the scene – been most places, done most things, just about survived to tell the tale. Alex P – D.J., party man(iac), legend. One of the ‘old school’ of DJs, there during the early days of house music, he has become somewhat of an elder statesman of the scene – been most places, done most things, just about survived to tell the tale. Early gigs came at the almighty Sunrise raves in the U.K., some of the notorious, infamous raves that attracted major press headlines at the end of the 80s. After playing to thousands at such an early point in his career, the next point for a young DJ at that time was Ibiza, a place that helped shape the reputation of Alex in several ways. After holding a residency at Amnesia, he then became the resident at the newly opened Space. After working there for a few months, a moment of inspiration changed the clubbing world. Alex decided to put some decks behind the bar of the Space chill-out area and to call it ‘The Full Moon Terrace Bar’. You know the rest from there. Alex began to get worldwide bookings, and soon became one of the headliners for most of the major house nights in and around the U.K.
His anarchic relationship with best mate Brandon Block blossomed during the mid-nineties – house music and clubbing was still relatively fresh and their hedonistic adventures were of the time and were told and retold with gusto by eager magazines and fans all around. They were the epitome of a good night out – no cares, as much fun as you could handle and hilarious tales to tell afterwards. 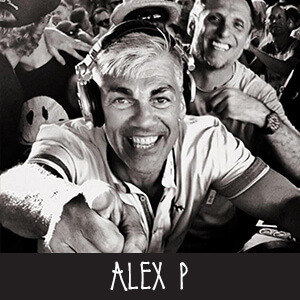 Alex was still a firm fixture and favourite in Ibiza, and the ever expanding compilation market at this time soaked up many an Alex P mix, selling thousands upon thousands in the process, further cementing his name amongst the elite of U.K. house D.J.s. In 1996 London’s Kiss F.M. gave Alex and Brandon a Friday night drive time show that was about as far removed from the normal perception of a radio show as is humanly possible. ‘Anarchy on air’ is one, not too wide of the mark, description. Ratings soared for the station such was the popularity of the show, but all good things must come to an end, and they left on a high and called it a day in 2002. After radio, Alex found a niche in front of the camera, presenting for the likes of MTV, Rapture, Granada, Sky and Kiss T.V. for a variety of adrenalin and sports shows and documentaries on Ibiza. He is still to be found DJing all over the world, recent gigs including Dubai, Tokyo, Singapore, Las Vegas, and Koh Samui. He is now an ambassador for the newly formed company The Disc Jockey Association. The D.J.A. is a dedicated and professional company set-up to look after the many needs of D.J.s today, be they beginners, semi-professionals or full blown superstars. Due to an exceptional talent and a personality that captivates all, Alex P is a house legend and is here to stay.